Fearing that American aircraft development was stagnating in the face of technological advances made overseas, the US Army Air Corps issued Request for Data R-40C in 1940 which the Army hoped would encourage designers to create innovative new aircraft that went beyond the traditional monoplane with engine in front arrangement that had become standard during the 1930s. Three aircraft came out of this request: the Vultee XP-54, the Curtiss XP-55 Ascender, and the radical Northrop XP-56 Black Bullet. This is the third installment in a three-part series that takes a look at the Request for Data R-40C aircraft. The final submission in the R-40C request for data, the Northrop XP-56 was, by far the most radical of the three. While the Curtiss XP-55 Ascender had mimicked a flying wing but with a long fuselage, the stubby little XP-56, nicknamed the Black Bullet for obvious reasons, was true flying wing, albeit with a short bullet-shaped fuselage, with wings that were swept slightly and fitted with anhedral wingtips. In order to prove the airworthiness of the flying wing concept, Northrop had built and flown the N-1M, a small proof of concept aircraft that Northrop had flown in 1940 as part of their research into the viability of the flying wing design. Following the successful flight of the N-1M, the Army gave its approval to build the XP-56. Like the other R-40C aircraft, Northrop had planned to use the Pratt & Whitney X-1800 engine, but they too were stymied when that engine program was canceled. Instead, they chose a Pratt & Whitney R2800 radial which turned a set of contra-rotating pusher propellers. The R2800 actually provided more horsepower, but the redesign of the fuselage resulted in a five-month delay in the project. The Black Bullet was also one of the first aircraft to be built from magnesium due to fears of a potential shortage of aircraft aluminum due to the war effort. Due to the difficulty of welding the exotic metal, Northrop developed a new heliarc method of welding, and patented a number of the tools used in the process. Upon completion of the first airframe in April 1943, ground testing began, but a serious yaw problem was soon discovered. Northrop traced this to the braking system, and once that was solved, the Black Bullet finally took to the air on September 30, 1943. Starting with flights barely above the ground to test the controls, the XP-56 gradually flew higher and higher in successive test flights, but a taxiing crash destroyed the first prototype before its true potential could be determined. 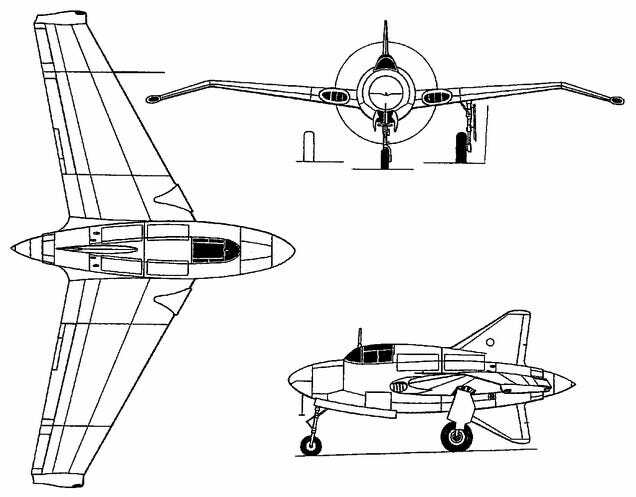 The second prototype tried to address some of the control difficulties found in the first, notably through the addition of a dorsal vertical stabilizer that mirrored the ventral stabilizer. The center of gravity was also adjusted. Still, flight testing proved disappointing, and with the advent of more advanced jet fighters, the program was canceled. The second prototype of the XP-56 is in storage at the National Air and Space Museum where it awaits restoration.